Joe Schumacher, CEO of Goddard Systems, Inc. (GSI), Craig Bach, VP of Education at GSI, and representatives from The Goddard Schools located in Ladera Ranch, CA (Mike Smithers); Mooresville, NC (Barbra Bryan); Concord Township, OH (Tina Turk) and Redmond, WA (Jeff and Shauna Barison) attended a Partnership for 21st Century Learning (P21) event titled “Closing the Skills Gap.” This event was held on Capitol Hill in Washington, DC on February 28. 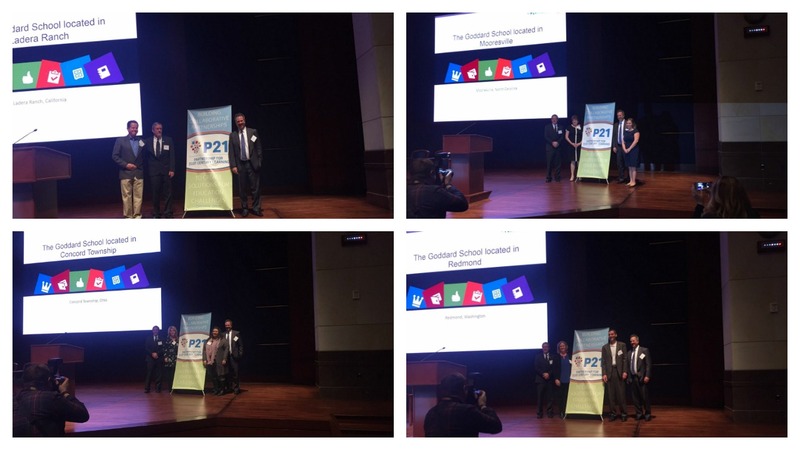 The meeting consisted of opening remarks made by the co-chairs of a bipartisan Congressional 21st Century Skills Caucus, a panel discussion with representatives from four Exemplar schools, including Barbra Bryan, recognition for the latest members of the 21st Century Learning Exemplars, including the Schools in Ladera Ranch, Mooresville, Concord Township and Redmond, and case studies from 20 Exemplar schools. The P21 Exemplar Program, instituted in 2013, identifies and showcases schools that are equipping students with the 21st century skills they need to succeed in college, career and life. There are also five other Goddard Schools with P21 Exemplar status: Cranberry Township, PA (Dina and Matt Speranza); Fort Mill, SC and Rock Hill, SC (Bill and Amy Strickland); Hendersonville, TN (Leisa Byars; Trevor and Sonia Pryce); and Cedar Park, TX (Butch and Maria Aggen). Only 12 preschools nationwide have achieved P21 Exemplar status, and 75% of them are Goddard Schools! Exemplar Schools are selected through a rigorous application process that includes site visits. Each Exemplar joins a national network that shares best practices to further hone their practice of 21st century teaching and learning. The group was addressed by Congressman Dave Loebsack (2nd Congressional District, IA) and Congressman Ryan Costello (6th Congressional District, PA) who are co-chairs of the Congressional 21st Century Skills Caucus. The event also featured a panel discussion titled “Closing the Skills Gap: Stories from the Field.” Several Congressional representatives also joined the full group after the ceremony to speak with their constituents. Even as an adult, I am awed by watching seeds germinate. I check my pots every morning in case a squash plant has grown an inch overnight. Let your children play in the dirt, especially if they are under three years old. 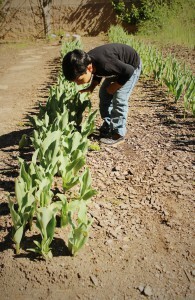 It is important for children to explore the texture of the soil and the plants. They will learn how to mold soil, to change its shape and volume and to contain a mess within a safe space for free exploration. These types of hands-on experiences help children make concrete connections to words and experiences. Sensory based play and exploration will cultivate your children’s physical development, especially the important small muscles in their hands and the tendons in their fingers. Teach them how to nurture. Your children will love taking care of plants and watching them grow. 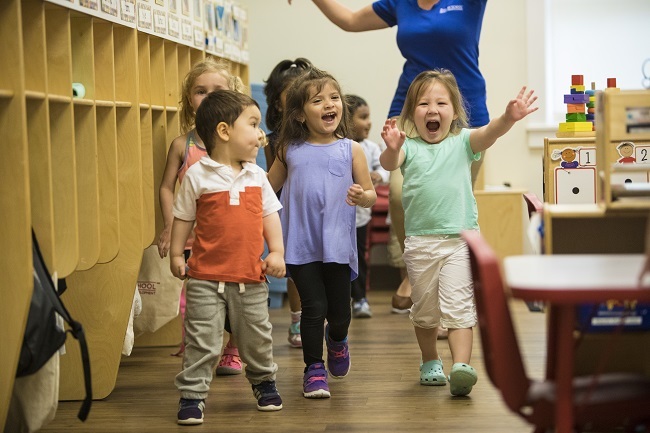 Preschool age children enjoy jobs that create a sense of responsibility. Working in a garden helps them see the fruits of their efforts, leading to a sense of pride and accomplishment. Talk to your children about the needs of the plants including food, water and sunlight. For children who are three years old and older, you can begin a conversation that compares what plants and people need to live. Your children can learn fundamental social and emotional skills like empathy, communication, cooperation and learn to identify and express feelings while gardening. While gardening, your children can learn fundamental math skills like patterns, sequences and numeracy. Consider the following activities. While observing your garden, ask your children to count the different parts of a plant as it grows. For example, you might ask, “How many leaves are there now?” Model and use comparison words like bigger, more than and faster. Measure the plants with your children and talk about how much they are growing. You can graph the height of plants over time together. Clear flowerpots can let you observe and measure the growth of roots, too. Always engage in conversations with your children. Read books about gardens and teach them new words about plants. Teach them the language necessary to speak about how plants grow. Ask open-ended questions like “What do you see happening?” or “What do you think the garden will look like next week?” to encourage them to think and communicate about their surroundings. Use a photo album or a three-ring binder with page protectors to create a book about your gardening experiences. You can review past experiences and encourage verbal and written language skills by reading it together. Your children can also use their creative skills to draw illustrations and decorate the cover. At the end of the summer, we hope that you will have a beautiful garden and an enthusiastic, blooming gardener. 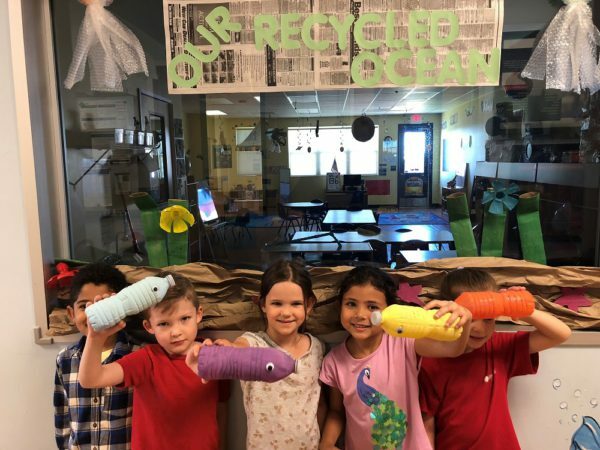 Conserving the environment is a priority, and helping to foster an eco-friendly mindset in children is more important than ever. Here are five ways to encourage environmental responsibility. Teach your children to garden. 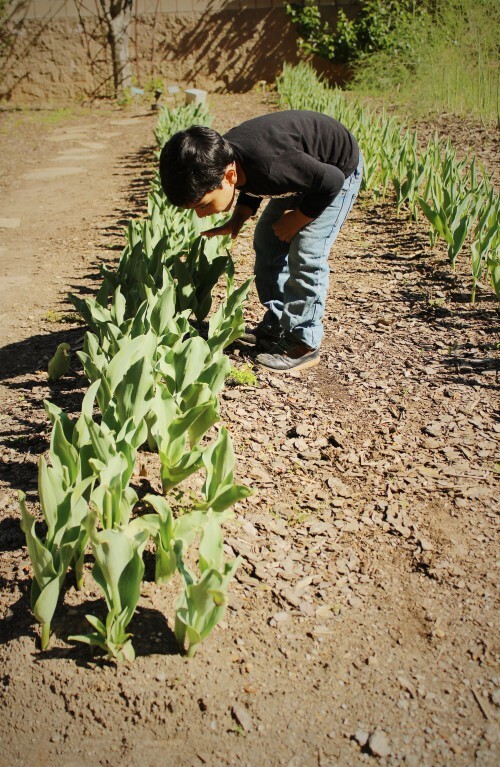 Gardening is an excellent way to teach your child some basics of biology, such as how the sun helps plants grow, how plants produce oxygen through photosynthesis and how vegetation contributes to a healthy environment. Enjoy some fun outdoor activities. Creating a wildflower scrapbook or going on an outdoor scavenger hunt may help your child appreciate all the beauty, wonder and fun the environment has to offer. Go for a hike. Whether you walk through the woods or just around a local park, hiking lets children experience the environment while getting some exercise. The internet can be a terrific resource for finding hiking trails close to home. Start at home. Recycling and conserving electricity and water at home with your child can go a long way toward preserving the environment. You can even make a game of counting how many different items you can recycle every week. Make something new with something old. Cardboard tubes, empty milk jugs and many other items can be given new life with a little creativity. Let your imaginations run wild and create something fun! The ability to be creative and think outside the box is important for problem solving and innovation, which are highly valued abilities. Here are five ways to encourage creativity at home. Read to your child. Before you begin, ask your child to close his eyes and imagine the story as you read it. Afterward, ask your child to describe what he saw while you read. Put on a play. Create a story with your child and then act it out. Encourage her to dress up like the character she is playing by using old clothes, hats and accessories. You could even record her performance and turn her play into a movie. Establish a play space. Set aside part of the basement, a spare bedroom or a corner of the living room where your child can explore and discover whatever interests him. If it gets a bit messy, try to be lenient with him since this space is meant for free play. Encourage free play. Free play is exactly what it sounds like – unstructured play time, a time when your child can play however she likes in the dedicated play space you’ve set up for her. Inspire your child’s inner Picasso. Keep plenty of art supplies such as paper, paints, paintbrushes, markers, crayons and modeling clay available in case your budding artist decides to create a masterpiece. This piece was originally published on 03/15/2015 on the HMH blog. We know that relationships are essential to healthy child development. We can observe organic collaborative behaviors even in very young children, who often explore their worlds and gather information while they play independently, but then eventually come together to learn and share experiences with others. Technology offers unique opportunities to cultivate the innate human instinct to collaborate. Educators and developers have embraced these possibilities by creating platforms and projects designed to facilitate learning experiences and communication–between peer groups, teachers and students, and school communities and families–and to expand virtual space for cross-cultural education. In 2001, education researcher Dr. Sugata Mitra launched a unique experiment he called the “Hole-in-the-Wall.”Mitra installed a public computer in a remote village in India. Young children in the village quickly discovered how to scroll, seek out information, learn English and more. In short, Mitra witnessed young children teaching themselves and one another via the computer’s resources. The Hole-in the Wall project cracked open the concept of a school “in the cloud” that children can access anywhere, anytime. The community computer and its content enabled a natural learning environment to grow, complete with encouragement from mentors, teachers, family and friends. As Dr. Mitra’s work demonstrates, technology’s potential to extend access to learning content far and wide is huge. In the last decade, partnerships between educators, ministries and organizations have helped to deliver content and training across the globe, from reading on mobile phones in developing countries to professional development seminars that can be viewed offline for communities lacking internet connections. An approach commonly called a “blended” learning model encourages classroom collaboration, and technology can provide a wonderful support system for the experience. For example, students may be organized into small clusters based on shared learning styles, abilities or interests. This organization allows teachers to focus carefully on individual students and to craft dynamic learning scenarios for an individual child or small group. Technology’s capacity to support personalized learning pathways allows for individually tailored pacing and practice, in turn promoting subject or skill mastery. As a result, students feel confident and are proud to share their knowledge. Digital games powered by quality content can improve attention, focus and reaction time. Whether there are two players or many, gamers acquire pro-social skills through healthy competition, which then translate to other relationships and aspects of life. Consult KQED’s Mindshift’s Guide to Digital Games and Learning for recommendations on digital learning tools. Increased connectivity can offer children real-world insight into communities and cultures around the globe. There are a number of exciting collaborative projects and platforms that create space for teachers, students and parents to communicate and learn from one another, regardless of geography. For example, ePals uses web-based tools to bring diverse learners together in virtual classrooms. Over 4.4 million students and teachers are currently participating in cross-cultural exchange on the platform. Look out for projects and competitions that bring kids together to reach common goals via online collaboration, like the Give Something Back Project’s Virtual Classroom. There are also many free apps to connect teachers, parents and students in order to support timely and confidential communication. Check outGoogle Apps for Education. This free suite of productivity tools helps keep parents in the loop on their children’s progress in class. Parents can log into Google Drive and see what their kids have been up to in any class and communicate with teachers. Whether you are encouraging technology-enabled collaboration at home or in the classroom, remember to balance screen time with face-to-face conversation and interaction.Encourage kids to think about digital citizenship and to act as positive role models for others in all social interactions, whether on-screen or off. Happy collaborating! This piece was originally published on 02/25/2015 on the HMH blog. At the beginning of this year, the Joan Ganz Cooney Center published Ten for ’15: Education Reform for a Shared Future, a list of ten takeaways and resolutions designed to give educators inspiration as they plan for a successful 2015. Number five on that list is a call to rethink the brain. 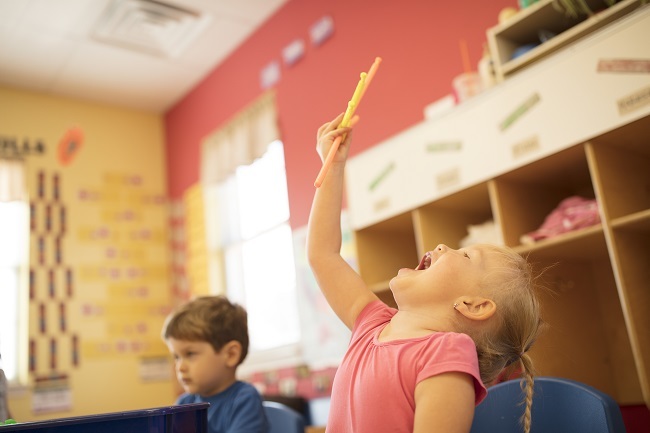 It may sound like a strange concept, but new, cutting-edge research on early brain development can help us gain a deeper understanding of early literacy and related behaviors. So, let’s rethink the brain today. First, some brain basics: Beginning in the prenatal period, the brain develops in a predictable sequence, accommodating a range of functions from the most basic to the most complex, from the birth of new nerve cells to the formation of intricate networks of transmitters that allow those cells to communicate. The brain undergoes astonishing growth during early life. In fact, it doubles in size during a child’s first year, and by age three, the brain reaches 80 percent of its adult volume. We also know that genetic inheritance and interaction with the environment, including human interactions with family and others, profoundly impact the wiring of the brain. This, in turn, impacts a child’s developing sense of resilience and his or her cognitive abilities, achievements, health and happiness. Dr. Patricia Kuhl, Co-Director of the Institute for Learning & Brain Science at the University of Washington, is currently expanding our knowledge about how young brains develop. She has been studying the period between eight and ten months of age — a critical time for early brain development — focusing specifically on language acquisition. Her research confirms that by the time that babies are eight months old, they can discriminate all sounds of all languages. They are truly “citizens of the world.” Then, at around ten months of age, there is an important shift. They start to become “culture bound” listeners. In a TED talk on the subject, Dr. Kuhl explains that as babies are busy collecting information about the world, human contact is essential for translating that data into language. Put simply, human interaction — the social brain function — plays a dramatic role in language acquisition. Very young children need human contact for learning and communicating. They won’t learn from a screen. The research leads us to important questions: How exactly does technology impact developing brains, especially in the earliest years? What are the long-term implications as children grow? Is it too soon to tell? Gary Small, M.D., professor of psychiatry and behavioral sciences at UCLA has noted that the brains of digital natives are “wired to use [technology] elegantly.” But he also cautions that young people between the ages of eight and 18, many of whom spend 11.5 hours a day on digital devices, are lacking in ability to use human technology. They may struggle with face to face conversations, non-verbal cues and eye contact – the same type of human interactions that are so critical for initial language acquisition. Seek Expert Advice: The American Academy of Pediatrics suggests avoiding television and other forms of electronic entertainment for infants and children under the age of two. Go Screen-Free: Create screen-free zones in your home, and use them! Create areas to read books, draw, play board games, dance and perform plays and music, and schedule time outside for physical activities. Make Family Time Count: Avoid using digital devices during family meals, especially dinner; use family time for real-time, face-to-face communication. Maintain a Digital Diet: Be thoughtful about the digital content your children consume. Check out our previously recommended resources to help select quality digital content. Be a Role Model: Remember that children model YOUR behavior. Are you distracted by digital devices when you’re with your children? Do the majority of your family interactions include a screen? Plan an unplugged weekend! Be aware if you are using technology as a babysitter — such habits can creep in quickly. When it comes to screen-time for kids, the choice of apps, games and films may seem endless. But just a little knowledge about the developing brain provides a golden rule – above all, human interaction and connection are the greatest learning tools we have. To prepare children for the modern world, STEAM learning (science, technology, engineering, arts and mathematics) has become an essential part of childhood education. Besides introducing children to STEAM concepts, it also helps teach children how to communicate, collaborate and think critically and creatively. These skills, otherwise known as the 4Cs, are essential to success in school and in life. Here are five reasons why. Critical thinking skills increase motivation. Children with strong critical-thinking and problem-solving skills are more likely to be motivated to achieve academically and less likely to be negatively influenced. Creativity provides a healthy emotional outlet. 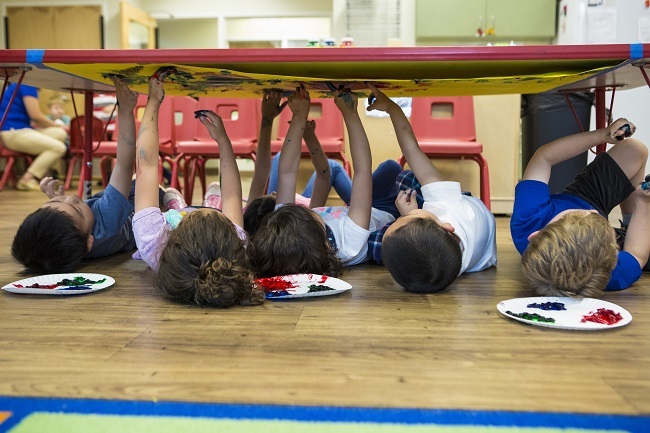 Children who express themselves creatively show less frustration, develop a joy for learning and acquire an appreciation for other perspectives. Communication and collaboration promote confidence. Developing communication skills through fun and collaborative methods fosters a sense of self-esteem, enables healthy emotional development and encourages teamwork. The 4Cs help build executive function skills. Executive function skills, such as planning, organizing and strategizing. These skills help children develop self-regulation, working memory and cognitive flexibility which will encourage them to learn new ideas and develop their social-emotional capabilities. Employers highly value the 4Cs. Hiring managers pay close attention to a job candidate’s abilities to communicate, collaborate and think critically and creatively. Encouraging young children to build these skills can help set them up for success later on.